Bobs Kwakka 82 750 twin. Hi, I built this trike from left overs of mini Suzuki and Honda 1500 and of course my old faithful kwakka 750 twin. My wife loves the ride. I am now doing a conversion from chain drive to shaft and fitting an electric reverse. All up weight 392Kg. Comments for Bobs Kwakka 82 750 twin. This post is really awesome. This bike is very powerful and design is really awesome. I love this bike. Really very nice. Bob - We can't wait to see the trike when you are done. Please upload a new picture when it is ready. 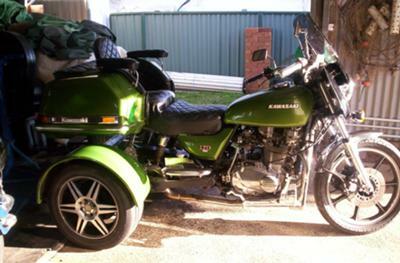 OK the kwakka 750 trike is now undergoing a refit and it should be two months to completion. Mai n object of the rebuild is to acquire some more power for steep country inclines.My engine of choice is the Yamaha XJ900 diversion not at all hard to fit into the Kwakka frame. Also VN1500 front end ;some more chrome ;rewire and the result will be a YAMASAKI/HONDA TRIKE. 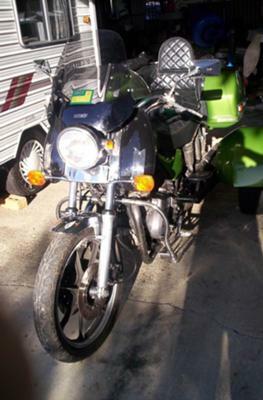 It looks great I have a 82 Suzuki I would love to do something similar but not sure were to start.